This chocolate pudding pie is my favorite no bake gluten free treat of the season. The filling is smooth as silk, plus the cookie crust slices clean, and adds just the right amount of crunch. Any kind of chocolate pudding has a special place in my heart since my grandmother used to make it for me when I was a kid. She made it from a box and had a tendency to cook even the “instant” kind, but I didn’t care. The lumps were my favorite part. You can make a pudding pie with JELLO pudding mix, and if you’re a grandma and you make it with love 💕, well then you don’t really need a recipe at all. But for the rest of us, this simple homemade cooked chocolate pudding pie is still super easy. And you can’t beat the smooth-as-silk filling. I usually make my own gluten free cookies for crushing. But when you’re shooting a how-to video for your no bake chocolate pie, you need lots and lots of cookie crumbs. So you can use a little help in the form of, say, Trader Joe’s Gluten Free Joe-Joe’s. I also often use these gluten free chocolate graham crackers because they’re perfectly crunchy with a rich chocolate taste but are only lightly sweet. But really any gluten free crunchy cookie will work. Any cooked pudding is so simple to make. You can of course just follow the recipe exactly as it’s written and your pudding will turn out beautifully. For me, though, it’s always helpful to understand the whys and hows, too. I like to think of it like this: If I could put all of the pudding ingredients into a pan and cook them at the same time, everything should thicken and taste delicious. But too much heat applied too quickly will scramble the egg yolks and lead to gritty, grainy pudding that isn’t even properly thickened. We avoid scrambling the egg yolks by creating a mixture with all of the ingredients except for (most of) the milk. Heat the milk separately, and bring up the temperature of the egg yolks very very slowly by pouring the hot milk into the mixture a few drops at a time. Then, everything can be cooked together until the pudding thickens properly. Adding some gelatin to the pie means that it slices cleanly and is stable even at cool room temperature. Otherwise, it wouldn’t hold its shape. I usually just include “whipped cream, for serving” as a recipe element. Since I often get questions about how to make whipped cream, though, I thought I’d give you some instructions and tips this time. The secret to making a stable whipped cream is to whip it on medium-high speed, instead of high speed. If you go too far and the cream starts to look more like butter than like whipped cream, just drizzle in a bit more chilled cream, and whip it again slowly. It should even things right out. In the video above (did you watch it? ), instead of whipped cream, I topped the chocolate pudding pie with homemade marshmallow creme. The pie itself isn’t overly sweet, especially if you use dark chocolate in the pudding, and the marshmallow creme is just so beautiful! You could even make the pie without the crust, and without any topping at all. A dollop of whipped cream on each slice, and a sprinkling of cookie crumbs will still impress the pants off your friends and family! *Homemade marshmallow creme also makes a nice topping. Make the crust. In a large bowl, mix the cookie crumbs and melted butter until well-combined. Press the mixture into the bottom and up the sides of a 9-inch nonstick or greased pie plate. Place the pie plate in the freezer until firm (at least 10 minutes, but longer is fine). Make the filling. In a small, microwave-safe bowl, place the gelatin and water, and mix well. Allow to sit for a few moments until the gelatin swells. It will be lumpy. In a medium-sized bowl, place the flour blend, sugar, cocoa powder and salt, and whisk to combine well. Add 1/2 cup (4 fl. oz.) of the milk, and then the egg yolks, whisking to combine after each addition. Set the mixture aside. In a medium-sized heavy-bottom saucepan, place the remaining 2 1/2 cups (20 fl. oz.) milk and bring to a simmer over medium-high heat. Once the milk reaches a simmer, remove the saucepan from the heat and add the hot milk to the bowl with the egg and chocolate mixture in a slow trickle, whisking constantly to combine. The purpose of adding the hot milk slowly is to avoid cooking the egg yolks by bringing them up to temperature slowly. Once all of the hot milk has been added, pour the whole mixture back into the saucepan and return to the heat. Cook, whisking constantly, over medium-high heat until thickened enough that the whisk leaves a visible trail in the pudding as you whisk it (2 to 3 minutes). Add the softened gelatin to the pan, and stir until the gelatin is melted. 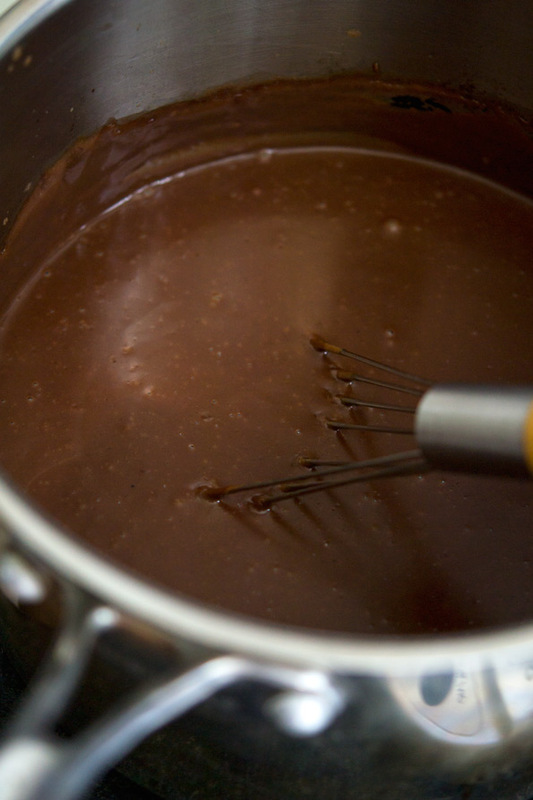 Remove the pan from the heat, and add the vanilla and chopped chocolate, and stir until the chocolate is melted and the pudding is smooth. Remove the pie shell from the freezer, and pour the filling into it. Allow the filling to cool for about 5 minutes. Cover the pie with plastic wrap, placing the plastic directly on the surface of the pudding to avoid its developing a pudding “skin.” Place in the refrigerator to chill until set (at least 2 hours). Before serving, make the optional whipped cream topping. In the bowl of a stand mixer fitted with a paddle attachment (or a large bowl with a hand mixer), beat the heavy whipping cream and the confectioners’ sugar on medium-high speed until stiff (but not dry) peaks form. Beating the cream on medium-high for a longer time instead of high speed will make a more stable whipped cream. Remove the plastic wrap from the chilled pie and spread the whipped cream on top, and sprinkle with a few more cookie crumbs. Slice with a wet knife and serve immediately. This recipe was originally published on the blog in 2013. The video, some photos, and some text are new; the recipe is tweaked slightly but mostly unchanged. Do you know if almond milk will work? I am dairy free and tried making pudding with almond milk once, and it stayed liquid-y because almond milk lacks the fat of cow’s milk! WOW, I wonder sometimes if you have spies, and I think maybe you do, because I’ve been wanting to make some kind of chocolate pudding pie for a little while now and was just about to peruse your books when BAM, this appears on my screen. I can NOT wait to make this! I’m ordering some superfine white rice flour ASAP (along with tapioca so I can make those Shakira bread rolls). I LOVE YOU TOO EMILY. What’s not to love? I love my books. I can’t wait until the release of the new one. Oh my law! This looks sinfully divine! I wish I had more kids to help me eat something like this! I’ll have to save it for our 4th of July picnic I think….. Thanks for all you do and the recipes you give to us. You. Are. The. Best. I’ll help you eat it, Jennifer!